The folks at Landscapeworks have a great knowledge of plants and trees, and a natural instinct for creating beautiful landscapes. For 30 years Landscapeworks has provided a full range of landscape design, construction and maintenance services. We design and implement in all seasons, fully integrating our work into the existing surroundings and anticipating your future plans. 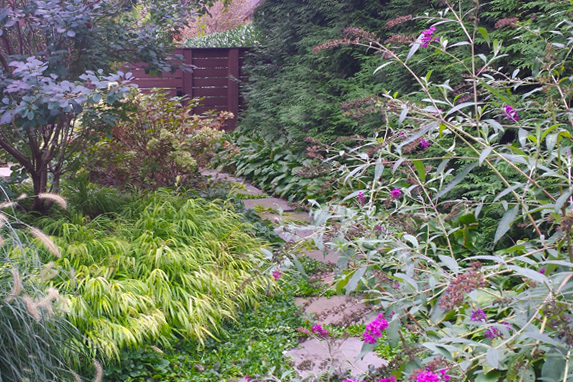 Our professional designers, trained horticulturists and diligent craftsmen all take an active role in each project, carefully tailoring the landscape to its natural setting and environmental conditions—while balancing seasonal imperatives to insure that your property looks as lovely in autumn as it does in the first bloom of spring. We see landscaping as a conscious opportunity for sculpting an outdoor space, creating garden rooms both large and small. Trust us to make your landscape vision a reality. Right before your eyes. Landscapeworks offers a complete range of services, and our design capabilities are matched by our detailed focus on maintenance and construction. We are fully prepared to handle all of your landscaping needs—or just one part, based on your preference. Our engaging, trained professionals can help you achieve your landscape goals by providing outstanding designsolutions and cost effective maintenance. In fact, we take special pride in completing projects on schedule and on budget. Please call us to schedule a complimentary consultation.